James Bond is easily one of the most iconic characters that the silver screen has witnessed, as his ability to get out of tough situations is second to none. The next instalment in a franchise that has run for 23 films and six different 007’s is due this year and, in honour of that, here are 10 of his most iconic moments. 007 (Sean Connery) is up against SPECTRE who are trying to steal a decoding device. The brutal fight with Red Grant on board the Orient Express is perhaps his memorable punch-up. It’s certainly one of the most realistic, as you feel every punch, kick, gouge and throttle. 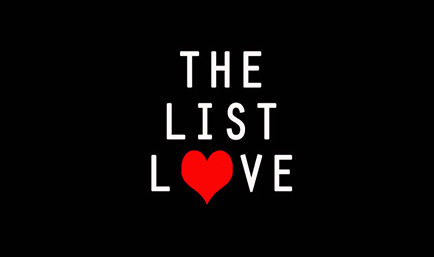 This 2006 film was Daniel Craig’s first outing and he was faced with Le Chiffre (Mads Mikkelsen), who finances terrorism. In a key scene Bond takes him on at Texas Hold’em in a casino knowing that if he loses, Le Chiffre will use his winnings for this deadly purpose, lending the scene a palpable edge of tension. Thankfully for Bond they are not playing at http://www.casinoonline.co.nz and so he can look into Le Chiffre’s eyes as he takes him down. A View to a Kill was Roger Moore’s last Bond movie and sees him battle Max Zorin (Christopher Walken) over microchips. It’s not regarded as a classic in the series, but Zorin’s fall from San Francisco’s Golden Gate Bridge adds to the 007 cool death scene legacy. Bond movie title sequences have become legendary, but it was only with this 1965 Sean Connery outing that they established the format. The film itself sees Bond trying to recover stolen nuclear warheads from SPECTRE in the Bahamas, but the title sequence introduces the barely-clad silhouette models that became a staple. Goldfinger (Gert Frobe) wants to destroy the world economy by stealing all the gold from Fort Knox, but first he kills Jill Masterson (Shirley Eaton) by coating her in gold paint – creating an iconic moment in this third Sean Connery film. Bond has to avert war by finding stolen international spacecraft in this Sean Connery outing and, although the films always find imaginative ways to kill-off characters, the scene where Blofeld bumps off Helga Brandt by dropping her in a piranha tank is one of the most memorable. 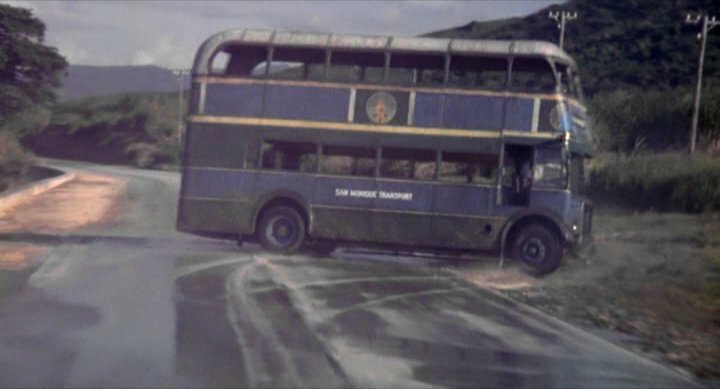 The chase scene involving a London bus is one of the most memorable moments from Roger Moore’s first movie, which involves Bond trying to take down drug baron Kananga, as the bulk of this vehicle adds comedy to the mix – culminating in the entire roof being ripped off by a bridge. 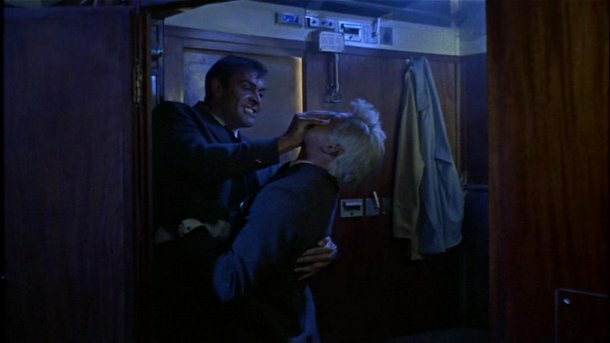 Diamonds are forever is remembered for the close combat fight scene between Bond and the jewel smuggler Peter Franks. The fight takes place in an elevator making for an extremely tight setting. In fact most times a punch is thrown glass shatters everywhere. To add to the excitement, the close space means the elevator control switch is constantly knocked moving it up and down. George Lazenby is Bond and 007 once more takes on SPECTRE – as leader Blofeld (Telly Savalas) plans germ warfare from his Swiss hideaway. Bond also gets married to heiress Diana Rigg, only for her to be murdered at the end of the film. The sudden nature of it is shocking and makes Bond seem more human. The very first Bond film, which has Bond battling an evil scientist trying to undermine the American space programme, begins in a casino. 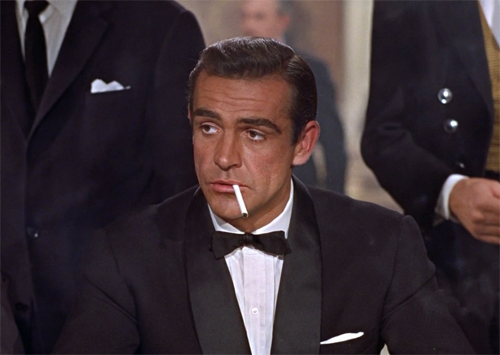 Bond hits the baccarat table, flips his cigarette case open and says “my name is Bond – James Bond” to Sylvia Tench, immediately establishing himself as the coolest cat in town. These are the moments that have made Bond iconic, and we can look forward to more from this year’s film.